We are all for an awesome mani, but how much is too much? 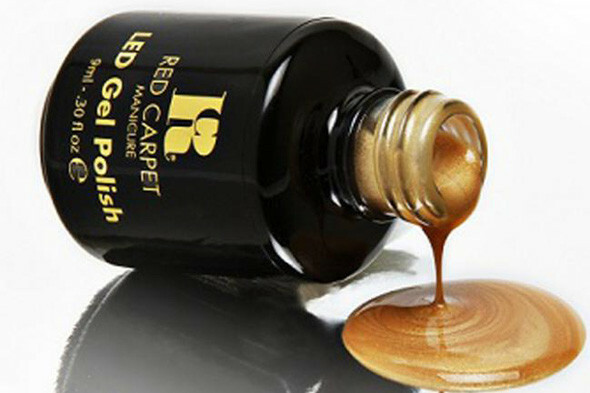 At the 2012 Grammy's Rihanna rocked a new nail polish by Red Carpet Manicure that contains a full once of 24k gold retailing at $5000!! It's a pretty gold color but nothing unique about this polish! (Other than the fact that it's made with GOLD!) All in all we think its a bit excessive RiRi! What do you guys think about Rihanna's mani? I love the color, but not for 5000 dollars. what is up with everyone having claws for nails? NOT attractive! peacelovevogue, we totally agree!! NO CLAW NAILS!! and what's up with the pointy trend?! Rhi Rhi's hands need lotion. For a $5000 manicure, wouldn't they throw in some buffing and lotion for those hands? YUCK. I lovee almond shaped nails & I lovee the fact that its trending again. But $5K is a lot to spend on nails. Smh. That could've gone to charity ! Check out my lil nail blog please. 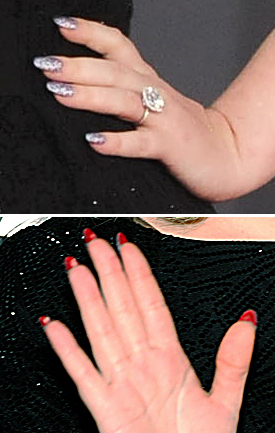 Adele's nails are quite clever! It's oddly cute and funny. The gold shade is gorgeous, but seriously, 5k for nail polish? Rhianna should forget about the nail polish and try exfoliating and moisturising her hands.